Godawari Fly By Wiretype Speed Governer is a tried and tested traditional speed limiter widely used in many Asian countries. The accelerator pedal is connected to a cable which relays the throttle (device controlling the flow of fluid) pressure. The cable is connected to the throttle cable and to the motor. An ECU controls the action of the motor. The speed sensor is attached to the gearbox and continuously detects the speed of the vehicle. The ECU compares this speed from the gearbox to the set speed(the speed limit that the vehicle should maintain). 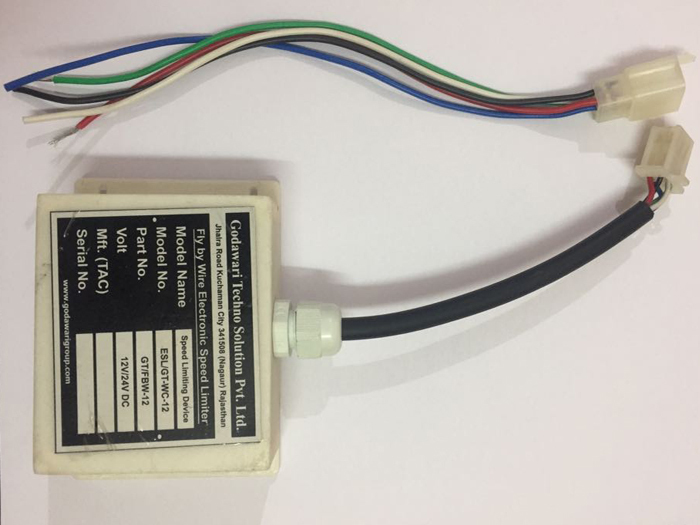 When the speed from the gearbox matches with the set speed or tend to go above the set speed, the ECU triggers the motor and the motor will pull out the cable. This will force the accelerometer pedal to become slack thereby reducing the throttle pressure and hence the speed of the vehicle.